Learn how you can get, use and share library resources like video, audio, images and ebooks for your research papers, coursework and enjoyment. Learn how to use digital information sources and tools for teaching and research. Discover new ways to navigate digital resources. Connect to expert librarians. Meet representatives from the companies who develop many eresources, such as EBSCO, ProQuest, Elsevier and Alexander Street Press. Learn how the Dartmouth Digital Library Program creates digital resources from rare materials and supports scholarly publishing. The Fair is open to all members of the Dartmouth community. Visit 6 of the 11 stations and enter a raffle for gift certificates to the Computer Store, local businesses and more! Visit all 11 to enter the raffle twice and enter a special additional raffle! 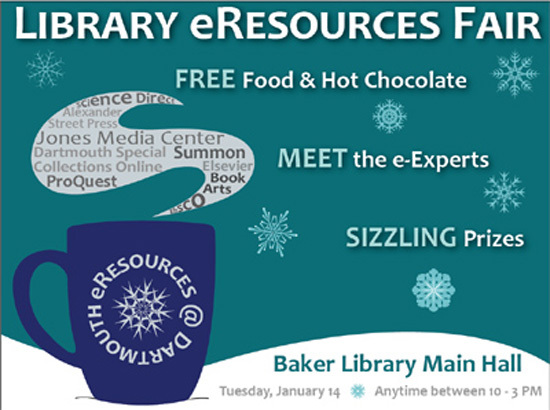 Learn to make movies, books, bibliographies, posters and papers using Library eResources. Learn about sources of music and images licensed for your use. Meet and talk directly with those involved in the creation of these eresources; bring questions, complaints and suggestions for improvement.